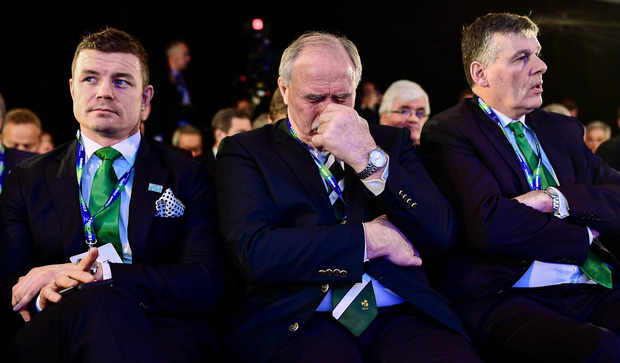 The IRFU pulled their Welsh counterparts up over their failure to back our World Cup bid last night. With the Welsh in Dublin to play Joe Schmidt's men in the Six Nations, IRFU President Phillip Orr revealed the Union took the chance to let Welsh officials know they "were not happy" about the World Cup snub. Speaking to Sinead Kissane on TV3 before kick off, Orr said:"We met with the Welsh committee last night, and we might have mentioned a couple of things about the Rugby World Cup. We had to send a message." Kissane then asked: "Did you express your disappointment with them?" "What do you think? Of course," Orr responded. "I have a duty on behalf of the people of Ireland, the governments and the IRFU to let them know we weren't happy they didn't vote for us being our nearest neighbours. "We had a lunch today and everything was fine. There's lots of us...and we in a way represent all the club volunteers the length and breadth of the country who give so much of their time to running club rugby in Ireland. "